According to Dr Hans Bode, Research Director (retired) Varta Batterie AG, Hanover, Germany, organic substances can help to reduce sludging of the positive plates when constantly resupplied. "Lead Acid Batteries", (John Wiley & Sons, New York, 1977) p 335. 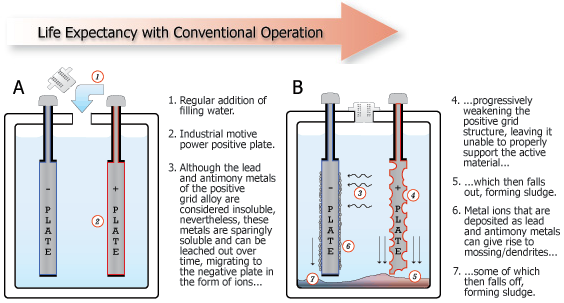 Batteryvitamin L falls into a similar category as the ligno-sulfonates, extracted from wood, that must be included in the negative plates by battery manufacturers to preserve negative plate activity; and natural rubber separators, that reduce the long term negative adverse effects of antimony in batteries. Chemically different, functionally similar. 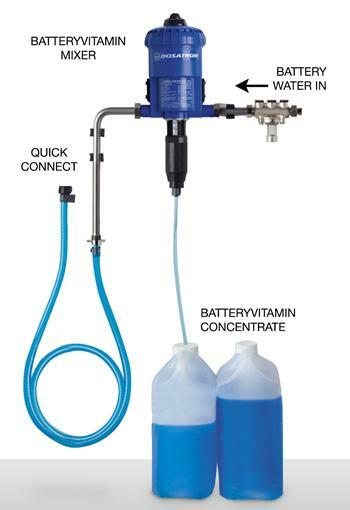 The nature of Batteryvitamin L makes it a powerful disinfectant - acting to prevent the Legionella, biofilm/slime and algae build up in the water supply in conformity with heath regulations. Batteryvitamin L works best at a very low concentration. At about 5-30 parts per million, (ppm), in electrolyte, it appears to have a purely physical effect, without any really significant chemical interaction with the battery cells. Above 1,500 ppm tests showed a discernable chemical interaction can be expected. Batteryvitamin L is typically slowly and harmlessly drawn in by the plates from the electrolyte, but above the recommended concentration is likely to be taken in increasingly faster - which therefore precludes an extra amount of Batteryvitamin L as storage in the electrolyte of the cells. This is why it is necessary to replenish the battery cells with diluted Batteryvitamin L at regular intervals. Soluble in water in all proportions, soluble in sulfuric battery acid at recommended concentration. 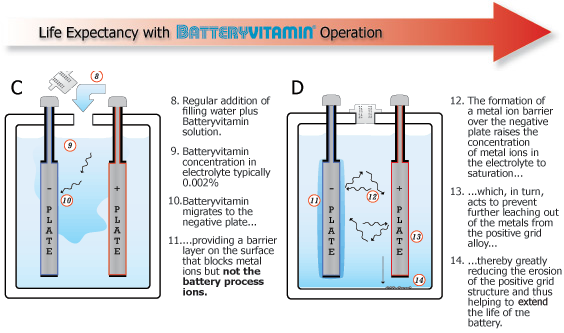 Batteryvitamin concentration will not rise with successive waterings since Batteryvitamin is consumed in batteries within 2 weeks. Concentration varies, typically 20 parts per million. Batteryvitamin is biodegradable. For disposal dilute concentrate 1 : 1,000 with water.